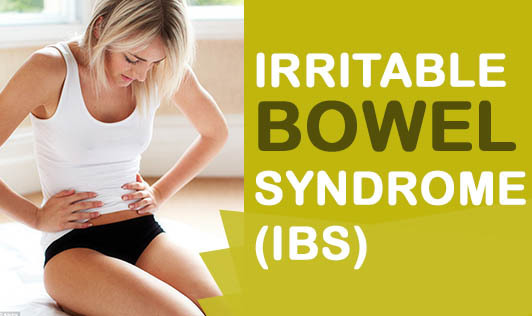 Irritable Bowel Syndrome (IBS) is a problem that affects the large intestine. It can cause abdominal cramping, bloating and a change in bowel habits. Some people with the disorder have constipation and/or diarrhoea. IBS is a common disorder and happens more often in women than men. No one knows the exact cause of IBS and there is no specific test for it. But it is important to be aware of the signs and symptoms as it is helpful in diagnosing IBS. Diagnosis: IBS is diagnosed on the basis of typical symptoms and the absence of other intestinal and non-intestinal diseases that might give rise to the symptoms. Treatment: Please seek advice from medical professionals. To control constipation, diarrhoea, and abdominal pain, medications are prescribed. Anti-depressant medication and psychological treatments also may be used. It is not clear if dietary alterations have much effect on the symptoms of IBS except for increase in dietary fibre, which may improve constipation and/or diarrhoea. Dietary Fibre: It is often recommended and is of benefit to IBS patients with constipation and/or with diarrhoea. • Soluble fibre helps both diarrhoea and constipation. It dissolves in water and forms a gel-like material. Foods rich in soluble fibre are apples, pears, kidney beans (rajma), chick peas (channa), oats, dates, strawberries and citrus fruits. • Insoluble fibre helps in constipation by moving food through the digestive system and adding bulk to the stool. Insoluble fibre is in brown rice, whole wheat bread, vegetables such as carrots, beetroot, cauliflower, cabbage, green leafy vegetables such as spinach, methi. Fibre in the diet should be increased slowly. Feeling bloated and having gas formation is common if the increase in fibre is too quick. Stress: It may trigger symptoms in people who have IBS. Seeking a medical professional's help about ways to deal with stress is important.